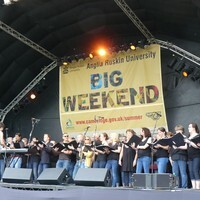 Cambridge's Dowsing Sound Collective wowed the crowds at the Big Weekend this Saturday, with a special set to warm up the 100-strong choir for its next gig, taking place in the stunning Apex Concert Hall in Bury St Edmunds this coming Sunday (13th July). Included in the set was one of the original pieces composed as part of the city's Cycle of Songs, a project conceived to celebrate the visit of the Tour de France to Cambridge. 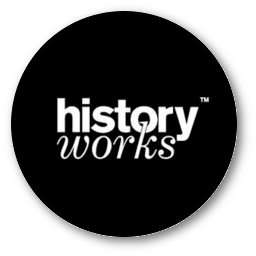 With words and music by the Dowsing Sound Collective's founder and musical director Andrea Cockerton, Reality Checkpoint - now available on the Cycle of Songs app - is an upbeat number detailing the history of Parker's Piece. And it was joyously interactive, as the audience on the green enthusiastically joined in with the resounding chorus. Dowsing has a growing reputation for staging large-scale events in some of the region’s premier music venues, including Ely Cathedral, but according to Andrea, it’s the set lists and line-up which make the gigs extraordinary. The group - made up of a mixture of experienced and first time singers, and pro and semi pro musicians - prides itself on crating set lists that surprise and challenge the audience. For the Apex programme, it is promising original covers from bands including Katzenjammer, The Gotan Project, Asgeir and Rufus Wainwright – a continual juxtaposition of genres and moods. Dowsing will be delivering the premier live performance of its Power to the People cover (conceived in collaboration with Basement Jaxx earlier this year) and also welcoming folk band Megson - nominated for 'Best Duo' at the BBC Radio 2 Folk Awards three years in a row - as special guests. And it’s all in a good cause. Profits from the gig go to supporting The Dosoco Foundation, the new musical foundation set up by the Collective to unlock the world through sound and music by funding small projects using music for social good. Split into two gigs (so that football fans can make the earlier one! ), Surround takes place at 4.30pm and 8.15pm respectively on Sunday 13th July, and each runs for 1hr30 without an interval. Tickets are priced £16/£13 (£12/£10 concessions), with family tickets available (£50 for a group of four with a maximum of two adults), and can be booked online at The Apex box office (www.bit.ly/apexsurroundpress) or by calling 01284 758000. To view the original article, first published on 7th July 2014, you can visit the Cambridge Network's webpage by clicking here.